Learn how to plot a correlation matrix using pyplot and object-oriented APIs in this article by Srinivasa Rao Poladi, the co-founder of krtrimaIQ a consulting firm that provides cognitive solutions to create tomorrow’s Intelligent Enterprises powered by automation, big data, machine learning, and deep learning. Matplotlib has a three-layer architecture. The top layer is called the scripting layer, and is implemented with pyplot() API. This API has been designed for users without much programming experience, so it shields the user from the complexities of creating and rendering the plots using the bottom two layers (artist and backend). For complex applications that use advanced features, such as patches, collections, interactive plotting using events, callbacks, animation, and widgets, we will have to use an object-oriented API. However, it requires quite a bit of Python coding experience to leverage full potential of this API. As new versions of Matplotlib get released, more and more of these features are moving into the pyplot API, reducing the dependence on an object-oriented API. The name object-oriented API is a bit confusing, as it may give the impression that the pyplot API is not an object-oriented, which is not true. It only means that an object-oriented API uses artist and backend layers directly, bypassing the scripting layer (without using the pyplot API). This gives the flexibility to use complete functionality offered by Matplotlib, whereas the pyplot API offers a subset of it. It should be noted that for any plot or figure, it need not be the pyplot API or an object-oriented API; it can be a mix of both. When we have to use a complex grid structure to place plots in a figure, we use an object-oriented API. When plotting each graph individually and creating figure objects and underlying canvas, we use the pyplot API. Once we see the differences between the two APIs, you will understand this combined use of both the APIs. In this article, you will learn the difference between pyplot and an object-oriented APIs. We will plot the same correlation matrix, first with the pyplot API and then with an object-oriented API. You can find the complete code for this article at https://github.com/PacktPublishing/Matplotlib-3.0-Cookbook/tree/master/Chapter05. 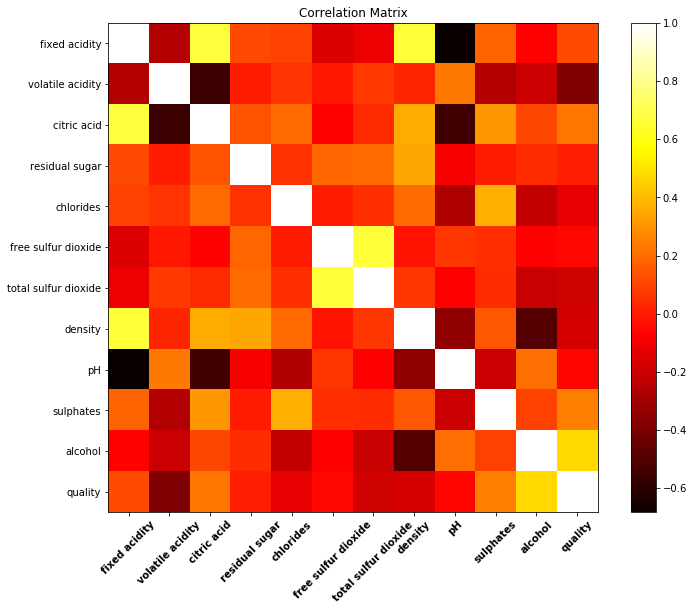 We will use an example of wine quality dataset for plotting the correlation matrix. You can find this dataset at https://github.com/PacktPublishing/Matplotlib-3.0-Cookbook/blob/master/Chapter02/winequality.csv. matplotlib.backends has a set of backends that it supports. Here, we are importing FigureCanvasAgg , which provides the space for plotting the figure and maps it to the defined backend device. IPython.core.display enables displaying the plot onto the output device. The following code block reads the data using pandas and plots the correlation matrix using the pyplot API. Figure(figsize=(12,9)) instantiates the figure object with a size of (12, 9). FigureCanvas(fig) attaches the canvas (area where the figure needs to be plotted, which ultimately gets displayed on the connected backend device). In the case of the pyplot API, we don’t have to do this, as the pyplot API takes care of it. fig.add_subplot(111) creates the axis object within the figure object created earlier. Note that we can create multiple axes objects within one figure object. Here, we are creating only one axis, as we have only one graph to plot. axs.imshow(corr,cmap=’hot’) creates the correlation matrix as an image, using the standard colormap, hot. fig.colorbar(corimage) attaches the color bar to the image created before. To create ticks and ticklabels for both x and y axes, the pyplot API has the xticks and plt.yticks methods that take both tick positions and ticklables as arguments and manage both with one command. But, in the case of an object-oriented API, we will have to do it separately. set(xticks=range(len(corr)), yticks=range(len(corr)), title=’Correlation Matrix’) defines x and y axis ticks and title for the figure. It needs as many ticks as there are attributes in the correlation matrix. fontd is the dictionary with all the attributes to be applied on xticklabels. We can do the same for yticklabels also, if we want. set_xticklabels(corr.columns, fontdict=fontd) sets the xticklabels with defined attributes. set_yticklabels(corr.columns) sets ticklabels for the y axis. If you found this article interesting, you can explore Matplotlib 3.0 Cookbook to build attractive, insightful, and powerful visualizations to gain quality insights from your data. Matplotlib 3.0 Cookbook is your hands-on guide to exploring the world of Matplotlib, and covers the most effective plotting packages for Python 3.7. Srinivasa Rao Poladi has been in the IT services industry for over two decades, providing consulting and implementation services in data warehousing, business intelligence, and machine learning areas for global customers. He has worked with Wipro Technologies for two decades and played key leadership roles in building large technology practices and growing them to multi-million $ business. He spoke at international conferences, published many blogs and white papers in the areas of big data, business intelligence, and analytics.